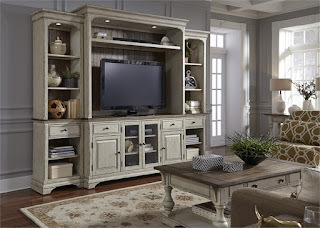 The Morgan Creek Collection by Liberty Furniture is made of Poplar Solids with Pine and Birch Veneers in Antique White Finish with Wire Brushed Tobacco Accents. The collection features: Planked Back Panel, Chamfered Pilasters, Heavy Crown Molding, Arched Top, Bracket Feet, and Pewter Nail Head Accents and Pewter Knob Hardware. LED Touch Lighting on hutch and Open Display Pier design offers plenty of storage space.